‘I was born in 1932 at 15 Delburn Street, and my family consisted of my Ma and Da, three brothers and my sister. Just before the war I started school and attended London Road Primary School, and later went on to Riverside for my secondary education. Another pupil who also attended Riverside was the football referee Tom ‘Tiny’ Wharton. He lived in Williamson Street and went on to marry a girl from Malcolm Street. In his married life he lived in Silverdale Street. 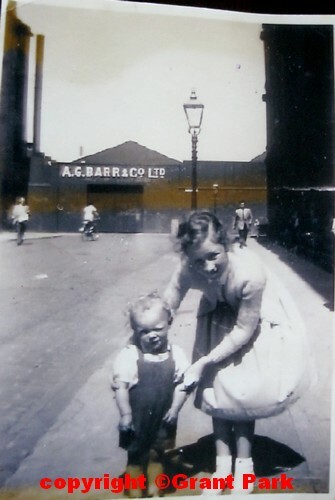 As a kid the streets were my playground, and I spent most of the time playing football in the street, kicking the ball off the side door of Barr’s lemonade factory in Malcolm Street. During the war there were bins we called ‘pigbins’, and people used to put their leftover food and scraps which would be fed to the pigs. We used to play football round them and take turns jumping over them, much to the annoyance of everyone around. I remember a man with a pony and trap used to take us for a ride for twopence, I think it was, I would have been about 7 or 8 at the time. He would ride along Janefield Street, all the way along with the cemetery on one side and Celtic Park on the other. During WW2 there were barrage balloons in Elba Lane, just behind Malcolm Street, and the Air Force would use Newland Primary School. My mother worked at Colvilles during the war. After the war the balloons and the ballast blocks were all removed, but they didn’t remove the eye-hooks, and we used to trip over them when we played football on the spare ground. Sometimes we used to go into Janefield Cemetery, or the Eastern Necropolis as it was known, and the Superintendent was a man we nicknamed Bozzy. I joined the 67th Boys Brigade Company, who were out of Calton Old Parish Church at Helenvale Street, and the Captain was a man called Mr Allan, but I didn’t stick it long. There were loads of shops in Springfield Road and one of the best known was Tony Capaldi’s cafe. When the war came along many Italians were rounded up for internment, and the Capaldis had the windows of their cafe smashed. Tony went on to tell everyone that he had two brothers serving in the RAF, and the persecution seemed to stop. When we were boys, we used to play cards, and whoever won had to take us all down to Capaldis and buy us hot peas, they tasted great. Tony lived at 9 Whitby Street, and I believe the actor Peter Capaldi, who appears in ‘The Thick of It’ is his grandson. Other shops I remember were Samson the bakers, and Archie Leitch who also had a bakers shop in Springfield Road, and became a dispatch rider during the war. He went on to marry a woman called Carmichael whose family had a fruit business. Then there was Martin’s the grocers, whose shop was to become The Clansman public house. I also remember there was a pawnshop in Springfield Road near to where Frank Cross the butchers still stands, as well as McDevitt’s, who was an undertaker. When I was about 14 I recall seeing a Cossack in the City Bakeries. He was part of a troop who were appearing in a display at Helenvale Park. Up at Westmuir Street was Wylie’s, the up-market grocery store. Parkhead was a very lively place, and I remember workers going to the Singer’s factory at Clydebank, getting on the train at Parkhead Station in Whitby Street. The main employer in the district was Bearmore, and at the Parkhead Forge they had gates which they would close, shutting off Duke Street at Shettleston Road, to allow the little railway engine to cross from the foundry to other parts of the work. As I reached my teenage years I enjoyed cycling, and would often use the track at Westthorn. We also used to play snooker and went to a hall in Dechmont Street we used to call ‘Smokey Joe’s’. As I got a little older I really enjoyed dancing and would visit dance halls all over the city. I remember one time when I had just turned 18, I went into the Straw House pub in Parkhead with my friends before heading off to the Barrowland. We met my father and he bought me a pint of beer. After we finished our drinks we left and headed off to Barrowland. The next day my father said to me I had let him down in the pub the previous night. Slightly puzzled I asked him why and he said I had not bought him a drink back. I still had much to learn about pub etiquette. Around the same time I also enjoyed having a bet on the horses or greyhounds. This was the era of the street bookie, and all lines were signed by the betters using a ‘nom-de-plume’, by which they were identified. Being young, and slightly green behind the ears, I used ‘Grant’, which was the name I was known by. It was also at that time a fairly unusual Christian name, so had the betting slips been found by the police, I would have been an easy capture. One of the street bookies was a man called Jimmy McLeish, and one of his great nephews went on to be manager of Rangers. In those days the newspapers could be read at Parkhead Library every day, but they used to cut out the racing section so as not to encourage gambling. Also at the library you were issued with two tickets, one red and the other yellow, which entitled you to borrow one fiction and one non-fiction title. I used to enjoy going to the pictures and Parkhead had a few to visit. My favourite was the Granada in Duke Street which was by far the best. The 3 ‘P’s in Tollcross Road was good as well. I also went to the Black Cat in Springfield Road, which was all on the one level, and on a Saturday night the manager used to stand at the ticket booth wearing a tuxedo. It was a really cold hall and my father used to be allowed to sit beside a heater when he went there. One of my first jobs was with a firm called Aird’s from Springfield Road who were removers and hauliers. I remember one time I went with the driver through to Kirkcaldy to pick up linoleum for the show-people down at Vinegarhill. Around this time I also attended Stow College up at Cowcaddens but I didn’t stick it for very long. We lived in Malcolm Street. My gran and grandad were in no.7, the Hanrattys. My parents lived 13 Malcolm Street when I was born 1961, my dad was away in the navy we then moved to tollcross road till about 1965. Very interesting writeup and photograph! The reference to Toni Capaldi reminded me of my dad telling me this about him – Mr Capaldi put his own photograph on display in his shop window in Springfield Road during WW2, in British Army uniform and with medals. This was to counter any negative feeling towards him, being of Italian origin. I believe Mr Capaldi served in the British Army in the First World War. Any comment I have heard about Mr Capaldi was that he was a friendly and generous man.